We have been in business of retailing on the web since 1998. One thing we have seen is a steady stream of fad diet products, fad diet pills, fad diet recipes and just plain ole FAD DIETS that are designed to make someone very rich and some very unsatisfied. Personally, we stay away from these products because they usually contain all kinds of stimulants, colors and fillers and are filled with a lot of empty promises; after all this is why they are called Fad Diets. Not so with Jeunique One Day Diet Wafers aka One Day Diet Food Tabs. These food tabs or diet wafers, which ever you'd like to call them actually have a complete day's worth of vitamins and minerals, lots of protein and other helpful ingredients for your day to day health. They have much more than that though, they have Crystal Chews for your non-diet food days and they come in 3 delicious flavors. Jeunique (which really means "I am unique", One Day Diet Wafers means YOU can take control over your dieting and your food choices. Jeunique understands that you need "ten fingers up" in your diet and it doesn't have to be with stimulants but instead with stimulating your body to better choices. That is why Jeunique not only created the One Day Diet but also the Crystal Chews but the non-diet-days are just as important, if not more, than your diet days. They have developed a revolutionary concept in dieting: eat sensible, "normal" meals one day and then diet the next with delicious , nutritious wafers and fruit. Some people make it complicated by wondering what fruits to eat on the One Day Diet. It is simple. Just use this as a rule of thumb: You may eat any fruit on your One Day Diet ON days but it makes good sense to limit them if possible to lower your intake of starchy fruit like bananas and plantains. 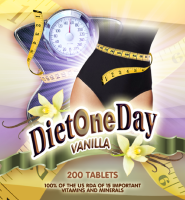 Jeunique One Day Diet Wafers are available in 3 different flavored wafers - Swiss Chocolate, French Vanilla, and Wild Berry and each bottle of diet wafers come with tasty orange-flavored crystal chew wafers for your food days. Crystal Chews in Orange flavor only(56 Chews) These CAN also be ordered separately. Each bottle will cover 7 diet days and 7 non diet days. If you are purchasing for a month, consider purchasing more than one bottle in order not to interrupt the diet. Ingredients in One day diet wafers need not scare you; they are vitamins, minerals, proteins and flavoring. Many of the ingredients you will find in any protein drink. The protein helps to level your blood sugar throughout the day. These delicious wafers contain Protein, Carbohydrates, Polyunsaturated Oils, Fiber, Vitamins and Minerals. They are available in 3 flavors and the ingredients below are found in these flavors. The One Day Diet contains Fructose, canola oil, calcium caseinate, nonfat dry milk solids, sodium caseinate, corn syrup solids, dipotassium phosphate, iron, zinc oxide, copper gluconate, cocoa, natural and artificial flavors; natural raspberry, strawberry, blackberry, blueberry and black currant flavors, silica, citric acid, lecithin, retinyl palmitate, cholecalciferol, d-alpha tocopherol acetate, ascorbic acid, niacinamide, calcium pantothenate, pyridoxine hydrochloride, riboflavin, thiamine mononitrate, chromium picolinate, folic acid, biotin, selenium proteinate, potassium iodine, cyanocobalamin. Crystal Chews are delicious, a natural Orange Flavor, and are very important for your total nutrition and weight management plan on your food day (non diet days). Fructose, calcium carbonate, apple pectin, malto-dextrin, dipotassium phosphate, psyllium husk, citric acid, oat bran, ascorbic acid, prune powder, magnesium stearate, orange flavor, acacia gum, silicon dioxide, ferrous sulfate, thiamine mononitrate, riboflavin, niacin, pyridoxine hydrochloride, cyanocobalamin, folic acid, stearic acid, selenium proteinate, chromium picolinate.